We got your back! We selected a variety of football gloves brands, to cover all that you may look for, and reviewed them for you. We have been thorough and we did our research using genuine experiences and feedback. Read on and you will not be disappointed! With an impressive array of 38 colour combinations on offer (yes we counted!) the Cutters Rev Pro will no doubt carry your favourite. A pair of these enhances your performance and is not just a necessary addition to your sartorial football game-style this also offers great comfort and good fit for you as a player. These work extremely well, however, except in the rain, where its grip is not as good as when conditions are dry. The same is faced when you get some dirt on the palm area, but once cleaned it should be grippy and functions well again. The fingertips on these are also a little stiff and hard and have the tendency to pinch for some. Some have trouble with the sizing, but as with football gloves, refer to the sizing chart and measure your hands carefully for size selection. 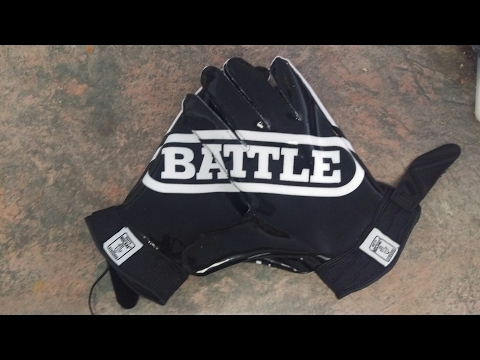 Cutters are described as one of the best in the category of football receiver gloves, these perform well for the player especially in stopping a ball. This is down to the technology it employs, namely its own-patented “C-Tack”. This also goes true for the thumb area – which adds to your hold on the ball. The perforation on the palm area allows breathability and your hands remain cool most of the time. These will not come off unless you take them off, which is down to the secure band and neoprene cuff area. This is an important feature as a player, as you want that snug and easy feeling, which allows you to focus on your game more. With the addition of well-placed panels and padding it is no doubt that Cutters football gloves provide you with the protection you need during games. Plus point is that it is machine washable and it dries easy – and still has impressive ball retention power after washes. Great for your important football match, or day-to-day training – these work as promised. Stops and hold on to the ball, letting it go when you want it to. Feel secure with the added padding and panel. Good all round pair, and what you need to be a great player! As with the Nike brand, this is a pair that you can place your trust in. It works as intended, allowing you to be the best player you want to be! The colour selection is wide – you can definitely find it easy to match these to your other football gear. A number of people experience problems with getting the right size in these. Therefore, as you always need to with getting a pair, always refer to the manufacturer’s chart and measure up your hands carefully. 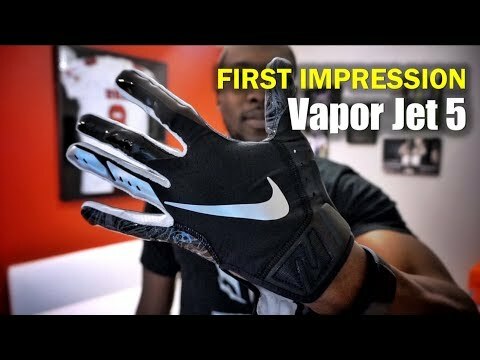 The Nike Vapor Jet tends to run small, and with this in mind, size up when in doubt of which size to get. In terms of function, this is an unbeatable pair that any footballer will be satisfied with. It halts the ball, securely gripping it and its adhesiveness ensures that you will not let it slip unintentionally. Focus on your match strategy and that is all you should do! The “magnagrip” does it for you. It is also breathable, as Nike has added a stretch of woven material on the back of the hand. This makes it easy for the gloves to release heat – thus why Nike has named it Vapor Jet 5.0, which is a rather apt name for it. As for security – you have a number of features. There is some lightweight padding at the base of the thumb, which is always a risky place and is prone to injury, particularly when you are trying to stop a fast moving ball. The seams in the pinkie area prevent unwanted twisting and injury risks. You can securely put it on and it stays in place with the specially designed wrist grip area. 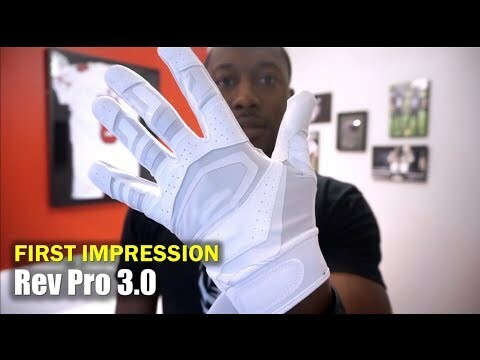 This is indeed what you would expect from Nike with the Vapor Jet 5.0. Your game will no doubt be enhanced, not to mention your hands stay protected. The design and attractive colour selection does not hurt either! 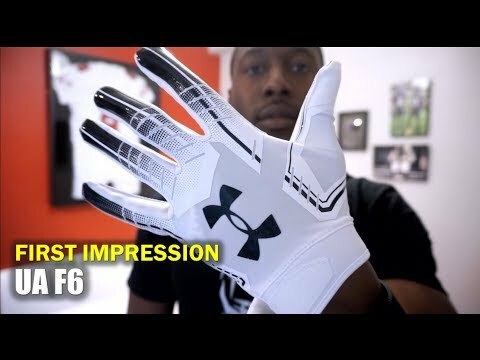 If you tend to have trouble with catching football passes and is looking to improve this, these Under Armour F6 football gloves can really help you! It has all the features to increase your catch confidence and improve your game. What more, it comes in a variety of 20 attractive colours and ensures a good snug fit for the keen footballer. The sticky silicone that makes this a great pair also has the tendency to get rather scuffed and dirty quickly. What is worse is that it also catches all kinds of unwanted lint from clothing! Another drawback is that it stinks easily after use and needs to be washed quite often to prevent unpleasant odour from permeating from it. The best feature of these gloves is the “sticky” palm and finger side, which helps with gripping the ball. These features are what you need to catch passes with confidence. Never again will you let a ball slip! As for the material, the Under Armour F6 is made to feel soft and the palm area is sewn as a single piece to enhance comfort. At the same time it is strong enough to protect and feels sturdy. There is a soft, comfortable fabric on the inside of the glove, intended to let air flow in and out. It makes your hands breath easier, wicking sweat away. This helps keep you hands cool during the duration of the match. What makes balls adhere to these is the sticky silicone material on the palms, especially designed for this purpose. There are also Velcro closures at the wrist that give the gloves a secure fit. The Under Armour F6 NFL gloves is just what a player needs to perform and take his game to a next level. This is as you can focus on your moves with the confidence that your ball catch ability is increased and you can play with the assurance that you grip will not slip! The highly popular Adidas Adizero is not only attractive in design, but also delivers good results for the football player. This is not a surprise considering that the brand is well known and has been making quality sports gear and apparel for number of years already. The advanced research put into it is apparent in the construction of these gloves – which satisfy even the most picky team player looking to enhance his football performance. One observation that is rather disappointing is that these are not very durable. For some, it lasts for about a few games before some bit of the seam unravel. There are only two colours to choose from – a rather small selection as compared to other products by competitors making similar product. The Adidas Adizero is very light in weight – you barely feel it there on your hands. it is more like a second skin than anything else. The fit is good – snug and true to the size chart provided. This makes it easy for you to select one, which usually is a rather tricky process. It has a stretchy back area, made with a material that is enough to create compression but also to custom fit to your hands whatever size they maybe. This feature also promotes air inflow and promotes breathability for your hands. The best bit of these football gloves is of course the grip on the palm. Adidas claims that these are functional in any weather condition, and performs consistently, therefore, so would you! It seals in at the wrist with a combination of fabric and neoprene, with a looped band. Therefore, rest assured that it would not slip off unless you take it off yourself after the football match. Lightweight and comfortable, the Adizero is indeed what a player needs in any game. You can play in a match in comfort, plus catch those tricky ball passes with confidence! Just the pair of gloves you will need for the match season. Ever thought of a pair of football gloves that will last a long time, and one, which you can rejuvenate the tackiness of easily? The Grip Boost Pro does all of this – while at the same time delivering what you want to enhance your match performance. Durability is an issue as some experienced frayed seams after a number of uses. This is especially observed in the finger area. Those with small-sized wrists complain that the closure is too wide – it does not secure well enough, and even lets water in when it rains due to this. 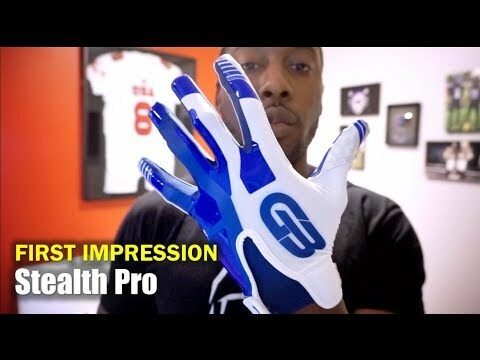 One of the best features of the Grip Boost Pro football gloves is its stickiness in the palm area, which is the right amount of tack to let you hold onto the ball. This grippy layer does not stop there – after a few games, should you want to make it sticky again, you need to only apply the glove grip gel and your gloves will continue to perform game after game. With its lightweight material, your hands will not be in a pool of sweat, especially if you are in humid temperatures. It is thin, and has been designed to be well ventilated. It fits snug to the hand, as the same material is stretchable enough to accommodate most hand types, contour and mould to it, with a large gusset to provide a custom fit NFL gloves. Rain or shine, you can expect these to be performing well without losing its hold onto the ball. It is cleanly stitched all around and appears to be really well made, faring as well as that of pricier brands. Just what a player needs in order to bring in a superbly clean ball catch, all minus the fumble. Should it rain, you have nothing to worry about, as these perform in all conditions. You barely will feel the Grip Boost Pro on your hands, as it is so light! It is comparable to other pricier brands, at a lower price point. The Elite Tek RG-14 is a less expensive alternative to a similar pair of gloves manufactured by one of the bigger name brands. It provides what you look for in terms of football gloves – comfort and functionality! These also look very cool, with well thought out design and well thought of colours that will look good in and out of the field. Without any elastic or Velcro at the wrist, it is a struggle to get into or out of these. You will need to pull it through and it is a challenge as these are designed to be tightly fit. Durability is also lacking as the seams has the tendency to fray after very few football games. In wet, rainy weather or on bright sunny days, a pair of these will see you perform well through any good game. It comes with a sticky grip on the palm area that is relentless and prevents unwanted ball slips. The tight fit of the design is done with the purpose of allowing finger and hand dexterity like no other. It is meant to be snug and therefore some proper checks are needed for you to get the right size. Sizing is flexible – suited to youths as well as adults, so no matter what hand size you have, you will definitely find a pair. It is also breathable, as the material it is constructed with is light, making it a good comfortable option. The manufacturer of these gloves are so confident of the quality of gloves they have made that it offers money-back guarantee should you not be satisfied with the pair you ordered. You can no doubt play football with the confidence that the Elite Tek RG-14 will function as its manufacturer intended. A value for money – you get the grip offered with these, similar to that of other more popular brands, but without breaking the bank. It ticks all the right boxes too – light and breathable, while functioning well in wet or dry conditions! With an impressive 11 colours to choose from, you can expect that the Battle Ultra Stick NFL gloves will enhance not only your catches but also make you look good in your game. As the name accurately describes it, these give you the confidence to go for the ball and take your game play to the next level. Due to its extreme tack, these will attract any kind of dust like no other. You will need to keep cleaning them. Some find that the internal stitches on the finger area are weak and can potentially rip apart after some time used in the field. This comes with the manufacturer’s 90-day durability guarantee and an unlimited defective warranty – as its maker is super confident of its construction and make, intended to satisfy your needs during practices and matches. Its tack in the palm area is unbeatable – it provides a maximum grip from your hand to the ball. It is hard to slip with a pair of these on your hands. Due to the thin material it is made of, your finger dexterity is not limited. You can also achieve the full range of motion in your hand, which is a great bonus to any player. While some gloves leave your hand wet, sweaty and uncomfortable, you will not feel this with the Battle Ultra Stick. It is very well ventilated, barely noticeable on your hands and they remain dry throughout. This is what you want – to not be distracted during an important match, allowing to focus on what it important. If tackiness is what you are looking for – you will not be disappointed with a pair of these on your hands. It works as promised by the makers, and it is an added bonus that these are comfortable to wear, as rightly priced too! Competitively priced and well designed, these promise enhanced ball grip and supreme functionality for the player looking to go into a football game with confidence, regardless of which position you play at. 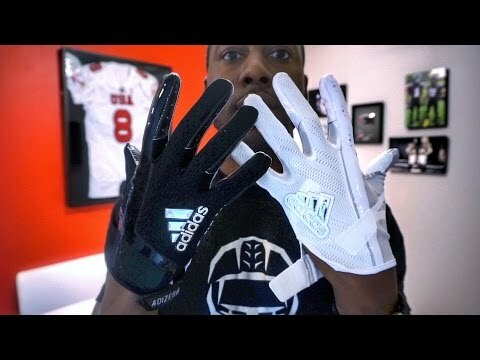 Straight to the point football gloves, these make a good addition to your gear and you will wonder why you’ve not gotten them sooner! Compared to other similar brands with the same description, the tack and stick of these are not as good as that of others. It goes away after about a season of use, although cleaning the palm area with antibacterial solution thoroughly may help to prolong its use somewhat. The colour choice is rather limited – there are only four basic colour combinations to choose from, as compared to a variety offered by other name brands. The sizing runs true to fit, and comes in a wide selection of sizes, which can fit youths and adults alike. Similar to selecting gloves of other types and make, as long as you consult the manufacturers charts and measure up carefully you will not be disappointed with the comfort and snugness provided by the Seibertron. It has a thicker padding in the area of the back of the hand, which makes this more durable in games, especially if you play in the defence position. Added to selected parts of the gloves are reflective bits that enhance visibility and look in the field. For those needing to catch the ball well – the palm is super grippy and you will perform with confidence. These can be used in rainy conditions as well as when it is dry. You can maintain good hygiene with the Seibertron as when it gets dirty, just pop it into the washing machine. The grip remains intact even after washing so you will still get a lot of use from them. An all round football glove that is value for money while giving you what you need for an excellent game. Players in tackle or defence alike can benefit with the use of these, as it not only get you the ball but has features to protect your hand should you need it. For the NFL football youth enthusiast – you can have these with the logo of your favourite team on. Indeed a plus point to keep the budding player stay motivated and focused on training and in matches. How best to show their support for their well-loved team if not by wearing a pair of their logos! These are specifically for youth players, but are rather limited in size. It tends to suit the more medium wearer and does not fit well for those too small or too large. The construction looks rather shoddy, with less than perfect seams in most places. These receiver gloves, once you get the right size, delivers good comfort and fit. It is made of polyester on the back of the hand. Use of this material makes airflow possible, and your hand will not be damp with sweat during your play or training. As with football gloves, what is important is the grip you will have on the ball. Rest assured that the palm is designed specifically with this in mind. A large whole piece of silicone is used here, and this provides superior tack and ball-grip rival to other big name brands products. These securely fasten at the wrist with a band made out of fabric and neoprene, and it is comfortable to the wearer. This also serves to provide support to the fragile area during games and prevent backwards flip of the wrist. The NFL logo of choice is placed on the back of the hand area, as well as on the wrist closure. It is definitely there and ultimately unmissable! Playing with the boost provided by wearing a NFL football logo adorning your gear probably is the best feeling for a young player. This NFL gloves not only does this, but comes with the features that you can find with other name brands – grip, comfort and protection while adding to the love and feel for the game. Very competitively priced but functional product made by a United States of America based company, these are a satisfactory pair for football and maybe the only one you will need for sometime. Players in the receiving position can be confident that you will no longer drop ball passes while having the Pure Athlete on your hands! Unfortunately there is no information or sizing chart provided by the manufacturer. It merely says that these are adult gloves and it comes in 4 sizes- ranging from small to extra large. The colour option is limited – you have to look elsewhere if you fancy something other than black! The palm area is covered with a sticky, tacky and grippy silicone, which is the best feature of this pair. It is intended for you to hold on to the ball, only letting go when you are ready to do so. It is thin enough to feel like a second skin and make you forget its there. The stretch the material gives makes it easy for you to move your fingers and hand, making is more comfortable to wear during a match or even while training. It is kept in place and remains snug and closely fit to your hand, helped by the wrist closures design into it. The Pure Athlete takes care of airflow ensuring that your hand can breathe easy with the addition the mesh panelling inserted on the back. 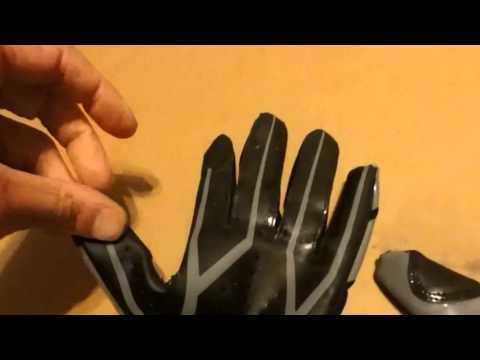 These football gloves can be used even when it rains or snows. Therefore something to look forward to as you know you can take these anywhere and they will enhance your performance. Well priced, but with features rivalling other pricier more renowned brands, these are suited to the no-fuss player who wants to excel at their game. Be it rain, snow or shine, the Pure Athlete football gloves will definitely appeal to the athlete in you. We hope you will be able to make a choice easier and with more ease, what with the information we have carefully compiled for you. We love the sport as much as you do, and have enjoyed reading up on the latest technology used to make gear such as this, which no doubt will enhance your game, no matter what level you are at. As a seasoned football player, you probably already know that your gloves make or break your catches. If you are just starting out in the game – be aware that this piece of gear is so essential to your performance that each part of the design and construction plays a role. But how to choose one that not only protects, but also suits your different playing conditions? Is there one that is right for you? Before you get kicking this season, read our guide and be ready to choose one that is perfect for you! We have done our research, gathered as much information as we can for what you should look out for in getting a pair of football gloves – read on! While you may think a glove is a glove, this is not so with a good pair. We have identified a total of four important sections to it, and each part plays a different role in protecting your hand and enhancing your performance. Let’s start with the finger area. It cannot be stressed how important fingers are to the player of this game. You use them to grip onto the ball caught, and keep it there until you are ready to let it go again. Therefore, in buying gloves, these functions must be at the back of your mind. Get ones that provide protection – for example, with spines on the internal seam of the fingers as this feature helps support them. It is also important to look for a material that contracts when force is applied, i.e. one that when you catch a ball for example, prevents the fingers from flexing backwards and breaking. The stiffness of material for this purpose is really up to you – some like the control provided by harder material, but others prefer roomier fit for finger dexterity. A good tip is to get a pair that is just not padded, but ones that have bendy inserts, well placed at the finger joints. These can either be made in plastic or other more advanced hybrid materials. The back of the wrist area or the backhand should be padded, to protect the area for when it is necessary. Latex cushioned ones are often better than foam padded varieties, but of course the price differs greatly. As for the palm area, you have the option between dimpled or smooth ones. During a match – using a smooth palmed pair help in making the ball cling to it with the addition of a clinging agent. As this substance wears off with frequent contact, most players reserve its use for competitive matches only. Dimpled palm is not as strong in terms of clinging to the ball but sufficient for practice as it weathers a lot of use. How the glove closes at the wrist is also a feature worth looking at. What you choose affects wrist support and ventilation. For example bandage type closures are supportive to the wrist but may not promote ventilation as the V-notch ones. Simply put – there are three types, namely, match, training and weather gloves. As the names suggest, match type pairs are usually reserved for competitive sessions and training ones are more day-to-day and are usually made to be more durable. Weather gloves are the ones you get for extreme weather or windy conditions. It may be useful to get all three, or at least the match and training gloves, depending on your level of involvement in the sport. This will allow longer life and usability for your pair as it is alternated in its use. Lastly, also look for how the sewing and cut is made. Seams sewn internally – termed as negative cut is most suited for slimmer hands, as it provides a snug fit. Female players may benefit from this type. Traditional ones are often flat-cut, and are roomier. Finally the Gunn cut is when the palm area material is rolled to the back of the fingers and sewn here. The effect is a tighter fit. A pair may also have a combination of one or two of these styles, and this is called the hybrid cut. Our extensive guide has been well thought out of and presented to you specifically to assist in your decision-making. We really hope it has served this purpose, and you will be united with a pair that will take your game to a higher-level ASAP!